Fig. 1: Side chair, De Young Museum: Fine Arts Museum of San Francisco (San Francisco, California) via Wikimedia Commons. 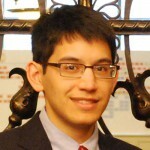 The Research Services team at NEHGS is occasionally approached with questions relating to the history of ownership (i.e. provenance) of a particular family heirloom. These questions are usually supplemented with stories about the heirloom’s first owner and how the object was acquired. Genealogists are uniquely qualified to carry out provenance research due to their familiarity with and frequent use of two sources commonly used in provenance research: wills and estate inventories. However, before consulting any of these sources, a serious study of an heirloom’s provenance should begin by studying the object itself. To illustrate how the study of an object is crucial to provenance research, consider the following hypothetical scenario: An individual is interested in documenting the ownership of a piece of heirloom furniture (a side chair) that has been in the family for multiple generations. For the purpose of this exercise, let’s say that the chair is similar in form to the image in Fig. 1, and that the chair is not a reproduction. According to family tradition, the chair was purchased by a distant ancestor (John Brown) from a Boston furniture maker. John Brown died in the Boston area in 1720. Utilizing the above works will help one to learn that the side chair under consideration is of the Chippendale style. 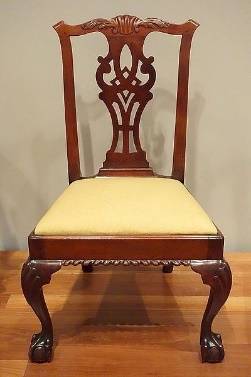 The ball-and-claw feet, the decorative pierced splat (or back) of the chair, along with the carving on the legs, seat edge, and top of the chair back are characteristic of the opulent Chippendale style. The form was common in American between the years 1755 and 1790 – several decades after John Brown’s death in 1720. Several different styles preceded the Chippendale style in America, including the Seventeenth-Century style (1620–1680), the William and Mary style (1680–1720), and the Queen Anne style (1720–1755), each of which possessed its own unique characteristics. Given this information, it seems unlikely that the side chair was acquired by the individual’s ancestor, John Brown. If the chair was acquired by John Brown, we would expect the chair to exhibit characteristics of the Seventeenth-Century style or William and Mary style. However, based on the Chippendale style of the chair, it is more likely that it was acquired by one of John Brown’s children or grandchildren. More research time might therefore be allocated towards researching the descendants of John Brown and locating their respective probate inventories. Additional research might also be dedicated to researching if the chair was in fact made in Boston. Overall, when researching a family heirloom, consider setting aside some initial time to research the object itself. Doing so will allow you – in some instances – to partly verify or question the history of ownership of a particular object. As in the above example, researching an object first might prevent you from performing fruitless searches and allow you to direct your research in a new direction. For additional information on American Chippendale furniture and the Chippendale style, see Fairbanks and Bates, American Furniture: 1620 to the Present, 139–94, and Eversmann, The Winterthur Guide to Recognizing Styles, 53–64. Eversmann, The Winterthur Guide to Recognizing Styles, 53. I am in possession of an antique pewter tea/coffee service set which belonged to my mother. Initially, I thought maybe it had also belonged to my grandmother as it looked quite old and this was verified by my sister. A number of years back I brought it to the Genealogy Roadshow and they gave me information as to about how old it was and what it was worth. However, it wasn’t until I’d been doing genealogy for a while and looked at my information on the set again, that I realized the set probably belonged to my 2nd great-grandmother! It was manufactured about the time of her marriage (1836) and must have been passed from mother to daughter since then. It is my intention to leave the set (info about it is typed up and stored in two places) to my daughter. If you cannot determine the age of a piece, take it to someone who can because you may be amazed. I have a set of Windsor chairs built in Halifax, NS ca 1825. I “know” that they belonged to my great-grandparents because my grandfather told me so. Where they were between 1825 and my great-grandparents marriage in NS in 1870. A challenge I inherited is a very plain, linen sheet, supposedly woven by a member of my mother’s ancestors, the Guthries who were linen workers in Co. Antrim before migrating to central New York State. Mother had wrapped it in blue paper, to protect it. It would probably date from the first half of the 19th C. Where and how does one test something like this: so simple, plain. There are laboratories that test textiles for materials and age. For example, flag collectors often require a laboratory report and expert opinion before they buy. Call museums and ask for a list of their conservators. I have always had a tiny silver spoon handed down from my McKnight family. It was perfect for feeding my three babies and I didn’t give it much thought. I asked my grandmother about it and she thought that a peddlar came to the family farm and melted down some silver coins to make the spoon. The spoon did have a silversmith mark IW or MI. I am a librarian and one day I had to cover the Reference area and I decided to see if I could find the mark in a sikvermark book. At that point I had not done any family history but I had asked about early ancestors and was told the McKnights were from Northumberland County PA and moved through central NY to help found Newfane NY in Niagara County. It turns out the WI stood for William Jones, no J’s in the 18th century I guess. WI was born in New Haven in 1694, apprenticed in Boston and worked there until 1720. He died in Marblehead in 1730 probably of smallpox. Well what I learned seemed ridiculous! The McKnights are my only American ancestors and they sure were not in New England! Right? So years later I really got serious about genealogy and sure enough my grandmother’s grandmother was from New England and I got her great grandparents as Joseph Anderson and Charity Nichols who were from Hingham but also Boston in the early 1700’s. Is it their spoon? Not sure. Another ancestor, Benjamin Prichard lived in New Haven County and lists silver spoons in his will around the same time! So far I have f found hundreds of New England ancestors! If spoons could talk. The spoon is no longer in the kitchen drawer. I have many items from relatives, but a couple of cups and saucers came with no explanation except that they were from my great grandparents. Both of them were descended from the original settlers of Norwich, Connecticut. They have no marks and certainly do not appear to be European. The design on them is the same but not exactly the same suggesting that they were hand painted — small purple flowers. Then, by chance, I was passing through Norwich and stopped at a motel overnight. The newspaper said that the Leffingwell House would be having an Open House the next day. Being a Leffingwell descendent, I stayed to go see the place. My biggest thrill was in the basement small museum where I saw cups like mine. The docents there were doubtful about the cups as well as about my heritage. It was not an encouraging attitude so I never sent anything back to them.